Istanbul’lu is a Turkish restaurant in Teele Square, a short stroll up Holland Ave from Davis Square. The restaurant is tiny; it is one room with 8-10 tables lining the sides. The night Amy and I went, the owner explained his waitress never showed up and so he was in charge of the whole dining room. 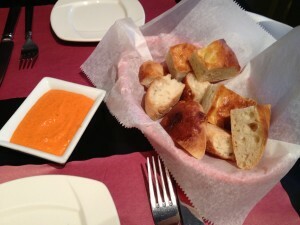 The meal starts with a basket of warm bread with a complimentary red pepper dip. The dip was delicious; we sopped it up and asked for a 2nd helping. Mucver ($6.5) – a zucchini pancake served with a thick yogurt sauce. I thought it was excellent; it was crispy and fluffy all at the same time. 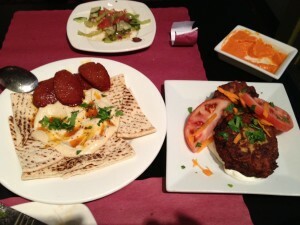 Leylai le mecnun ($9) – smooth creamy hummus served with Turkish beef sausage and pita. 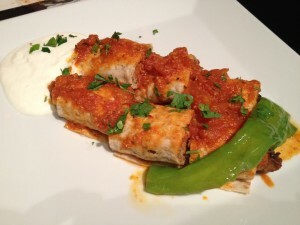 Sarma Beyti ($18) – I thought of this as Turkish Wellington. It was a grilled spiced ground lamb and veal mixture wrapped in a lavash bread. Amy loved the entrée. I thought the flavors were bold and delicious. The service was slow, as to be expected, but the owner was cheerful and friendly and did the best he could. The prices are very reasonable, especially given the amount of food you get. Had we known about the bread, dip, and salad, we might was only ordered just one tapas and entrée. I’ve read that Istanbul’lu does an excellent Turkish brunch, so I would love to come back sometime.